Pushing forward into a new frontier is always dangerous, but when you’re almost 1500 light years from home and something goes wrong its all to easy for everything to spiral out of control unless tough, often impossible, decisions are made. Connected via a a series of Gates that allow navigation through an endless void of vacuum, Space Station Benson sits in the Veil Nebula supporting a series of mining asteroids that collect the ore needed for the next outward expansion. A team nearing the end of their mission on one of these asteroids has gone suddenly silent after triggering a distress beacon. 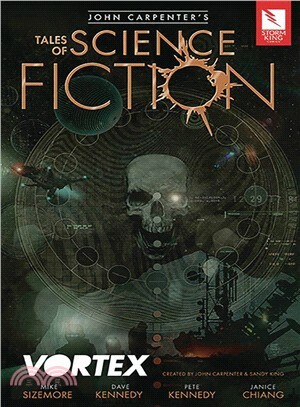 The station’s commander deploys a rescue mission lead by Jake Dixon - a man with a reputation as a hero or perhaps a murderer after a previous rescue mission lost a ship, but saved the station. What Jake finds on the asteroid will threaten not only his team and the hundreds of lives on Benson but perhaps threaten Earth itself. Edge of the seat story telling combined with incredible art create a new vision of space exploration meets horror where each turn of the page brings you closer to a maelstrom of madness and destruction. Join us as Dixon and his team come up against Dr. Dole Andersen a man with a secret so terrible that he threatens to pull us all into Hell with him. Join rescue crews, scientists, investigators, special forces soldiers, families and monsters, sacrifice and chaos. Join us as we face inhuman terror and incredible heroism. Join us in another far flung adventure set on the edge of a universe under the watchful eye of The Horror Master, John Carpenter, himself. Join us in the VORTEX. 256 pages of heart-stopping horror plus bonus pages that gives you a glimpse behind the curtain at how the series is created.